LAS VEGAS. After sitting out WBA welterweight champion Sen. Manny Pacquiao’s fight against Lucas Matthysse in Kuala Lumpur last July, trainer Freddie Roach is back on the team and said it’s no big deal that he has taken a backseat to Buboy Fernandez in preparing for the title defense against Adrien Broner at the MGM Grand Garden Arena. Roach was outside the ropes during every timeout in Pacquiao’s unanimous 12-round decision over Broner last Saturday night (yesterday morning, Manila). Inside the ring facing Pacquiao was Fernandez. On the other side of the ropes were strength and conditioning coach Justin Fortune and newly-designated cutman David Martinez. It was Fernandez who did most of the talking in between rounds although Roach and Fortune also said a few things. Pacquiao couldn’t be happier with the teamwork. He said his training crew was united and together again. Roach said the camp in Los Angeles was excellent. Fernandez supervised the camps in Manila, General Santos City and Los Angeles with Fortune by his side. Fortune made sure Pacquiao didn’t burn out in camp and even allowed days off to rest his body. Roach said it was the best Broner he’s seen in years. But his best just wasn’t good enough to beat Pacquiao. On a scale of 1 to 10, Roach said Pacquiao’s performance was exceptional. Pacquiao’s wife Jinkee, beaming with pride in the lockerroom, said she, too, thought Broner didn’t take a single round. She took a selfie with her husband as he walked into the lockerroom still in his fighting shorts. There was pandemonium in the lockerroom as family, friends and staff crowded Pacquiao to congratulate the champion for successfully retaining his WBA crown. Pacquiao is in the record books as the oldest active reigning Filipino world champion at 40. It was bedlam in the arena when Pacquiao descended the ring to proceed to a tent for a mandatory drug test. Fans reached out for Pacquiao, shouting his name and battling to touch the living legend. Security had difficulty cordoning off the fans and it took a few minutes for Pacquiao to traverse a short distance from the ring to the lockerroom. Pacquiao’s victory was dominant. Judge Dave Moretti gave nine rounds to Pacquiao and three to Broner in scoring it 117-111 while judges Tim Cheatham and Glenn Feldman had it 116-112 with eight rounds to Pacquiao and four to Broner. As expected, Broner didn’t throw too many punches and landed only 50 of 295 thrown compared to Pacquiao’s rate of 112 of 568. He's never been known to be a volume puncher. Pacquiao connected more jabs, 30-11 and more power shots, 82-39. Broner’s claim that he deserved the decision fell on deaf ears. The stats clearly showed the man is delusionary. 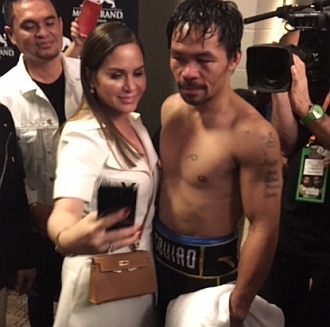 Photo: Wife Jinkee does a selfie with husband Manny Pacquiao after Pacquiao's victory against Adrien Broner in their WBA welterweight championship Saturday night in Las Vegas, Nevada.